This month, one of the featured topics was “All Things Hard Hats”. Presenters included Jason Cashmore of Kask , Chris Lohman of Pyramex , and Ryan Falterman of MSA . Jason Cashmore explained to attendees the many unique features of Kask safety helmets  and what made them different and exclusive in comparison to their competitors. According to Cashmore, 25% of construction fatalities occur from traumatic brain injuries (or TBIs), and most of these injuries on a jobsite occur from safety helmets coming off. Once the safety helmet comes off, there is no head protection, and injuries occur. Therefore, Kask safety helmets  come with chin straps that keep the helmet on the wearer’s head and in helmets that come in several sizes. “Furthermore, another difference in Kask safety helmets is the energy-absorbing foam. No matter where you are hit, the shock of the impact is absorbed,” explained Cashmore. Following the indoor presentations was a dummy drop outside by UTF Safety Specialist, Charlie Gertson . Gertson dropped the dummy wearing a Kask safety hat  and a competitor’s safety hat (each without chin straps). Onlookers were able to see how when the dummy wearing the Kask safety helmet was dropped, the hat did not come off-even without the chin strap attached. However, when the dummy was dropped with a competitor’s safety hat on, the hat was propelled off the dummy at the bottom of the fall. 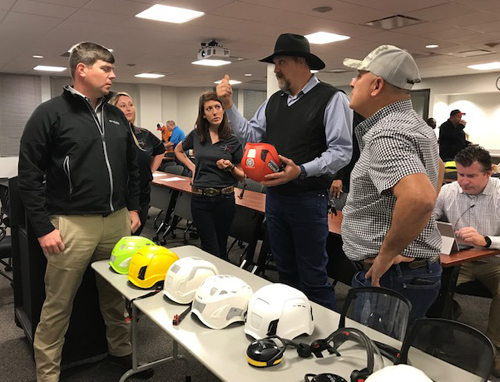 “So, you can see the added safety benefit of wearing the Kask helmet; it doesn’t come off even without the chin strap,” Gertson said. To buy or learn more about Kask safety helmets , please contact the UTF Houston showroom at 713-692-2323 ; in San Antonio at 210-495-8665 ; or in College Station at 979-731-8665 ; or contact UTF Safety Specialist, Charlie Gertson  at 713-823-9016 or charlie@unitedtoolandfastener.com.